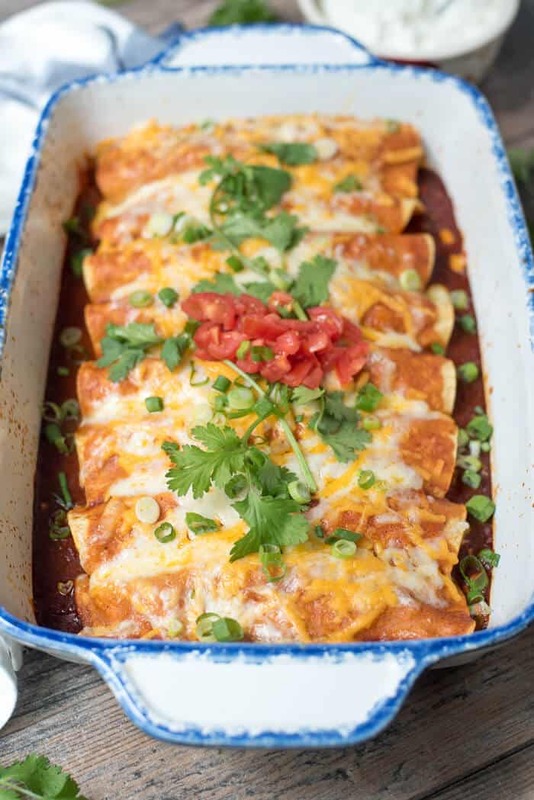 With some advance prep, these Easy Slow Cooker Chicken Enchiladas are a snap to put together. 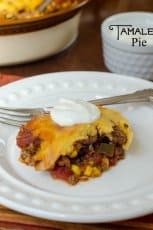 This is my go-to enchilada recipe and we love them! 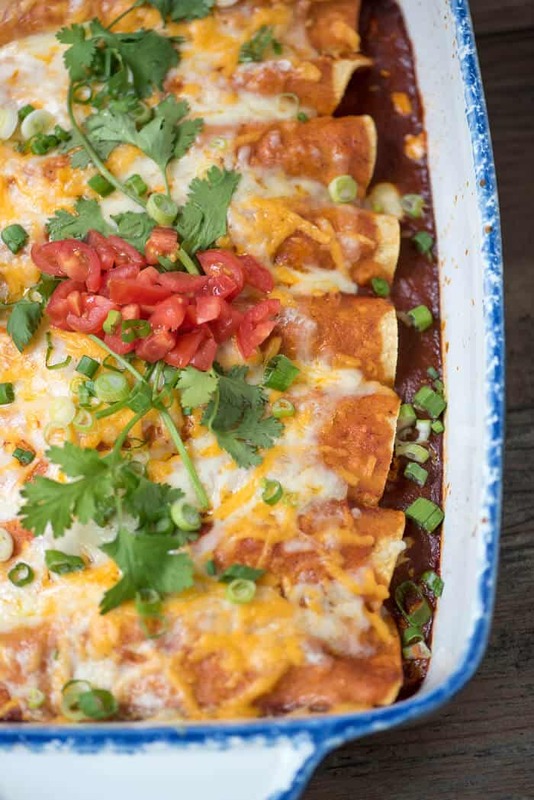 It is a good day when we get to talk about enchiladas. Wouldn’t you agree? 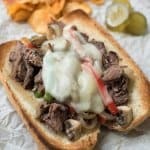 I finally got around to snapping some photos of the process for making this tasty recipe so I could share it with you all. 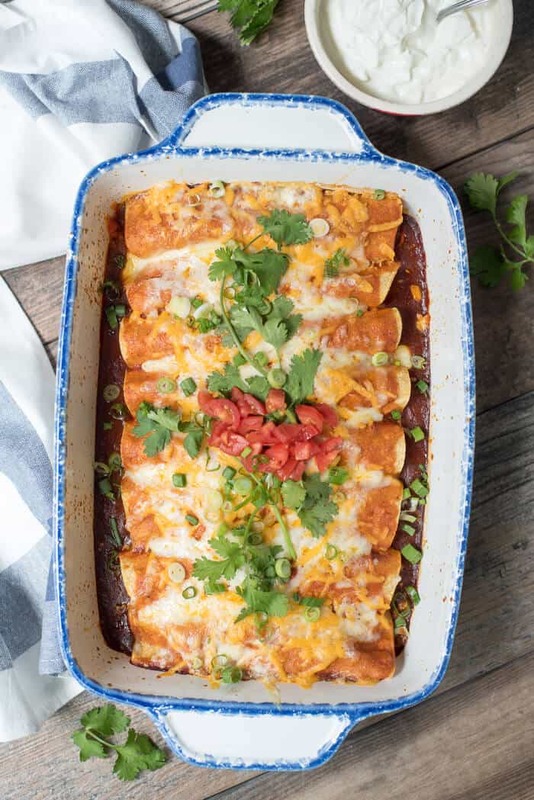 These enchiladas were heavily requested by my boys through their high school years and thankfully with the help of my trusty slow cooker, they are quite easy to make. 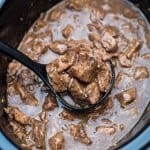 It’s kind of a drag when you’ve got one kid that decides that his most favorite meal in life is your not-exactly-fast-and-easy Beef Stroganoff. I’m not naming names (Boy #4). Ha! But seriously, he’s right. That stroganoff is very good and you should try it. 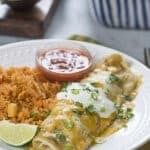 I’ve made a variety of different enchilada recipes over the years but this is the simplest of them all so it’s the one I’m sharing with you first. I guarantee it will not be the last. We love our Mexican food around these parts! I like to warm up some refried or pinto beans and cook up a batch of my Restaurant Style Mexican Rice to make it a complete meal. I honestly don’t think it gets much better than this. The fabulously tasty chicken filling is from my beloved Crock-Pot Chicken Taco recipe. 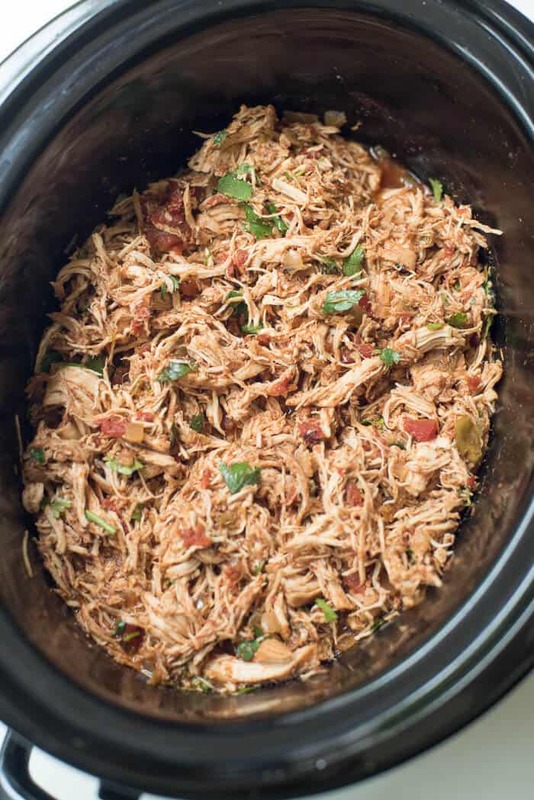 This recipe makes a great big batch of delicious shredded chicken that is perfect for a ton of recipes, including this one. I love the fact that there are always plenty of leftovers after taco night to get another dinner out of it. 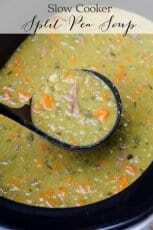 I’ll skip the step-by-step but check out the post for all the details and full recipe. Whether you cook the chicken the same day or a day or two in advance, you’ll only need a couple of cups of the shredded chicken for this recipe. Let’s talk tortillas. 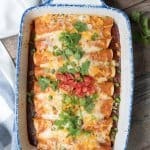 I’m using corn tortillas here but if it were up to my boys these enchiladas would be made with flour tortillas every time. Most Mexican restaurants here in California have at least one enchilada dish on their menu with flour tortillas and we love them that way. Go with what you like best. While corn tortillas are super tasty they are typically lightly fried in oil to make them pliable before filling and baking. I don’t like the mess and trouble of that step and I definitely don’t need the added fat and calories SO instead I place the stack of corn tortillas between a double layer of very wet paper towels and pop them in the microwave for about a minute, or just until softened. It’s definitely more authentic to go with the fry method and I’ve included instructions for that and also for using flour tortillas on the recipe card below. 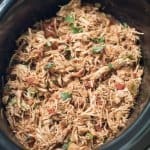 Place some of the slow cooker shredded chicken on a warmed tortilla along with some shredded sharp cheddar and Monterey Jack Cheese. Roll the tortilla up. 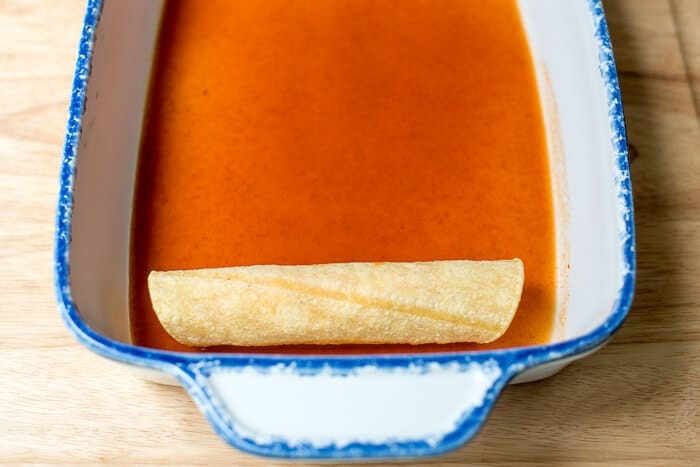 Pour a little enchilada sauce in the bottom of a baking dish and place the filled tortilla seam-side down in dish. 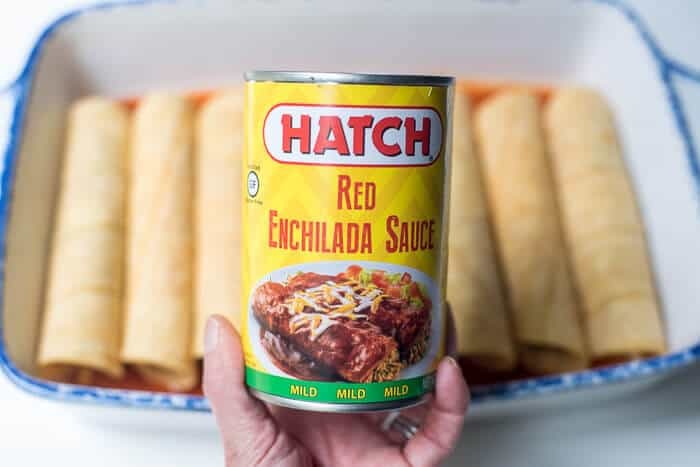 Hatch makes a nice quality red sauce that I always keep on hand. They make a green sauce that’s also very good. I will not apologize for this shortcut. Nope. Not gonna. We’re busy people and this sauce is good stuff! One day soon I will share my homemade version for those days when you’ve got the time to put in the extra effort. 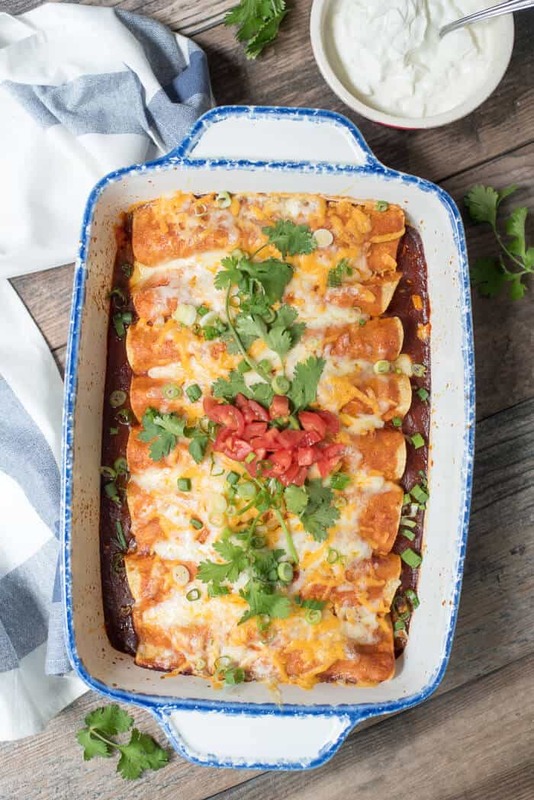 Pretty little enchiladas all in a row. 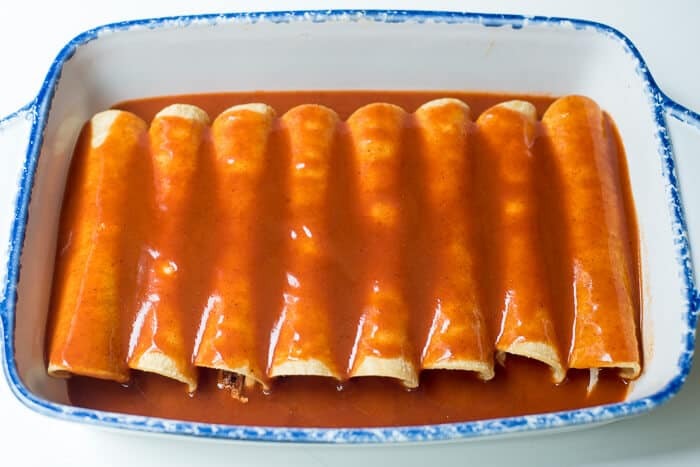 Pour the remaining sauce over the top of your filled enchiladas. Cover the dish with foil and pop it in a preheated 400 degree oven for 25 minutes. 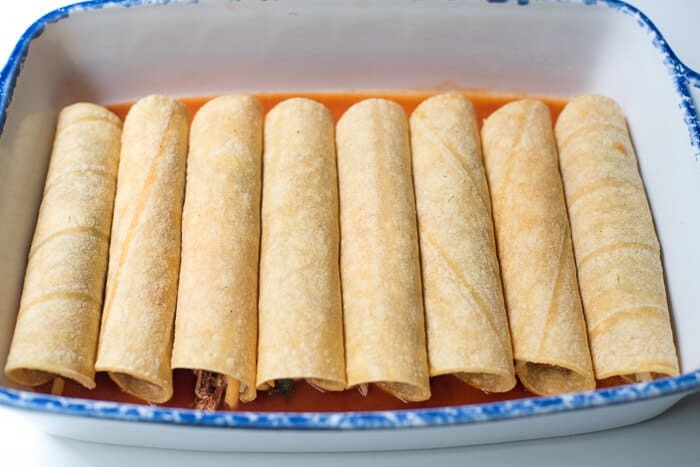 Remove the foil and sprinkle the tops of the enchiladas with shredded cheese and place it back in the oven for an additional 5 or 10 minutes or until the cheese has melted and the sauce is bubbly around the edges. And, that is it my friends! You can serve them naked or garnish away! I like to add some thinly sliced green onion and sprigs of cilantro. Some chopped tomato adds pretty contrast. Preheat oven to 400 degrees F. Coat a 13" x 9" baking dish with non-stick cooking spray. If using corn tortillas, place 8 tortillas in a stack between a double layer of wet paper towels on a microwave-safe dish. Cook in microwave for 1 minute, or until warmed and pliable. If using flour tortillas, warm a stack of 8 on a plate in the microwave just until softened, about 40 seconds. See recipe note if you'd like to fry your corn tortillas. Pour just enough enchilada sauce into prepared baking dish to cover the bottom with a thin layer. 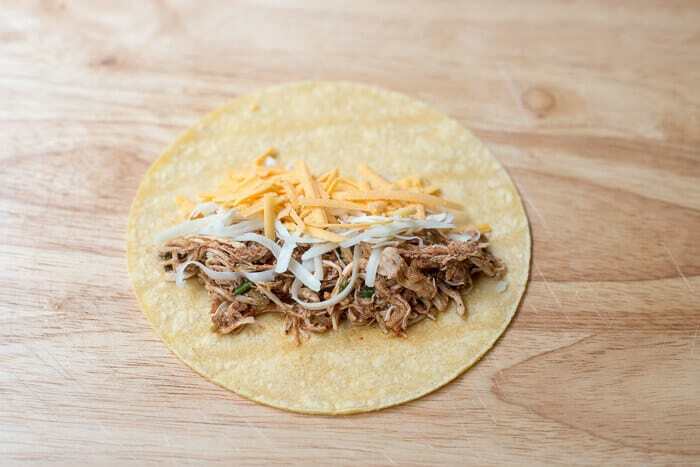 Spoon a few tablespoons of shredded chicken towards one end of a tortilla. Sprinkle with a bit of Monterey Jack and sharp cheddar and roll tightly. Place seam side down in baking dish. Repeat with remaining tortillas. Pour remaining enchilada sauce over the top of the enchiladas, cover dish with foil, and bake for 25 minutes. Remove dish from oven and remove foil. 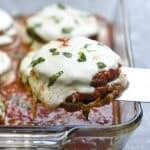 Sprinkle with remaining cheese and return to oven for an additional 5 to 10 minutes, until cheese is melted and sauce is bubbly. Garnish cooked enchiladas as desired. 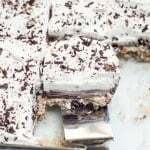 Serve with sour cream! Prep time does not include time to cook chicken. Chicken should be prepared in advance. Add a generous amount of vegetable oil to a 10" or 12" frying pan and place it over medium heat. When oil is hot (but not smoking) carefully slide in a tortilla. Allow to fry for only 10 to 15 seconds and then flip the tortilla and fry for just another few seconds. You don't want it crisp, just lightly fried and still pliable. 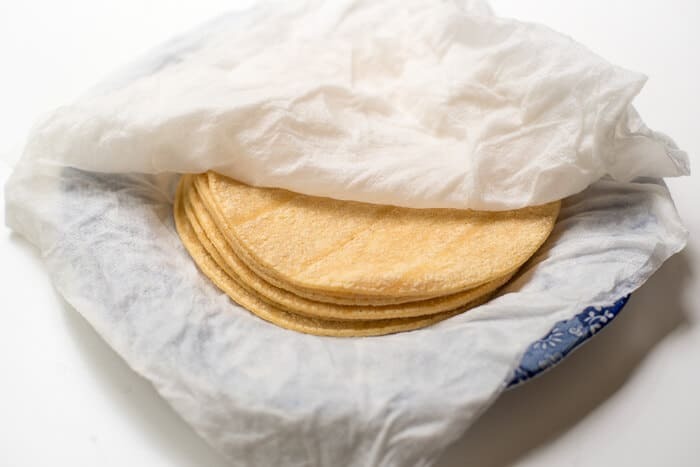 Transfer tortilla to a double layer of paper towels and blot off excess oil with a clean paper towel. Repeat with remaining tortillas and then proceed with recipe as directed. 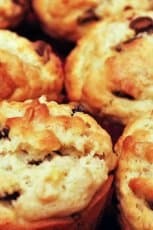 Made a batch of these tonight – really good! To mitigate the sodium I used Frontier Co-op Taco Seasoning and no-salt added petite diced tomatoes in the crockpot chicken taco recipe. There’s only two of us so I had enough of the taco mixture left to freeze three bags so more tacos, enchiladas and/or tostadas in our future. 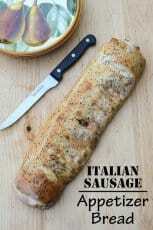 My husband came up with the idea of using it in stuffed pepper. I will add the cilantro as I use it. Thanks Valerie!! Hi there. I made the crock pot chicken and the enchiladas yesterday and got rave reviews from my family. Husband said it was the best thing I ever made. So thanks, Valerie! I’ll definitely be trying some of your other recipes soon. That’s fantastic, Jane! I’m so glad it worked out so well for you. That chicken has been made more times than I can count in my kitchen! Valerie I made this last night for my Family and were very happy with the results. They said it has now got to be a regular meal at least once a month. Thank you for sharing. My family is very picky, but I didn’t have one negative comment only Rave reviews.